German finance minister Wolfgang Schaeuble has said the institutions in charge of Greece's bailout have reached a "common position" on how to proceed. Arriving for a meeting of eurozone finance ministers in Brussels, Mr Schaeuble said: "I believe the institutions have a common position and that we will get to a point today where the technical mission can go to Athens so we can get a result." The IMF said it was indeed sending a mission to Greece, but it was "too early to speculate" about whether some sort of agreement would be reached as a result. It added: "More progress will be needed to bridge differences on other important issues." In its most recent assessment of the Greek economy, the IMF said: "Greece cannot grow out of its debt problem. Greece requires substantial debt relief from its European partners to restore debt sustainability." However, the Fund has said there was no need for what it calls an "upfront haircut" - a reduction in the principal that has ultimately to be repaid. In another development, the head of the European Stability Mechanism - the eurozone's bailout fund - said in a newspaper interview that Greece's finances were improving faster than expected. Klaus Regling told Germany's Bild that Greece would probably need far less than the agreed maximum loan of 86bn euros (£73bn) by August 2018 as a result. Athens has made a 2bn-euro repayment to the bailout fund as expected, which Mr Regling said showed "Greece is a reliable contract partner. 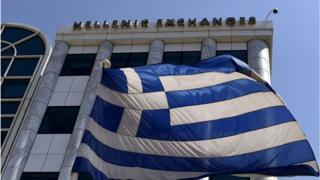 It is a sign that the restructuring of the Greek banking sector is progressing well."